Well this is the third and final part of my little series on Knit or Crochet Texan. I am sure I will repeat it as I discover more yarntastic local folk. Here are the links to Part 1 and Part 2 just in case you are playing catchup. 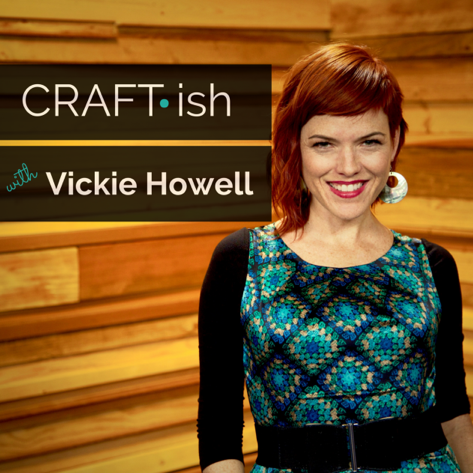 Local new Podcast: the wonderful Vickie Howell, author, designer, instructor, and broadcast personality in the craft world launched her Craft-ish Podcast last month. She lives in Austin, Texas which is just up the road from me. You must have come across her before. She has a really funky hair cut and I sometimes manage to catch her live Facebook stream Ask me Monday. Her podcast is really worth checking out. I have listened to the one with Clara Parkes several times. It is marvelous. Vickie kindly provided the image for me above. We are an artisan fiber mill located in the historic village of Independence- in the heart of boots and bluebonnets, right outside of Brenham, Texas. We are Paul and Dawn Brown, and along with the mill, we reside on the farm with our herd of angora and pygora goats....numerous barn cats, a few chickens, and some wonderful dogs. Our desire with the mill is to provide processing for the small independent fiber producer and fiber enthusiast, increasing value to the animals that give us fleece year after year. Of interest are those special breed specific fibers with a known "pasture of origin". There is certainly something added to the fiber experience, when you become aware of what animal the fleece belongs to, and where it's home is located. Dianne has been blogging for 10 years and podcasting for 3 years. I have just discovered her after finding her on a list of exhibitors at last year's Houston Fiber Fest. I am very fond of my podcasts and I really don't know how I managed to complete any household chores prior to having a podcast on the go! Hurrah for another crafty podcast.